Produced by Fearghus Ó Conchúir in association with Project Arts Centre and subsequently developed and toured with the support Culture Ireland. 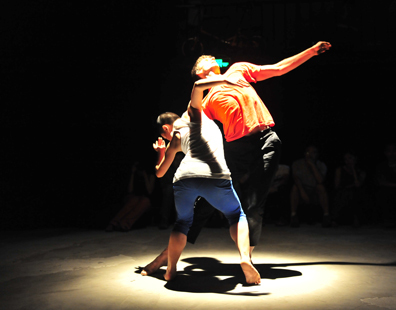 Dialogue is the first collaboration between an Irish and a Chinese choreographer. 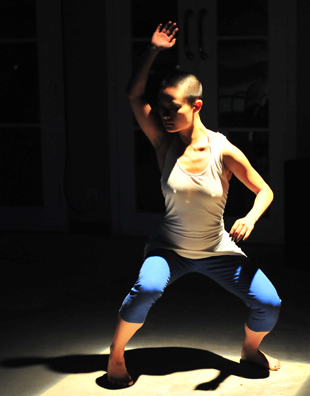 It started when I saw Xiao Ke perform in Beijing in 2006 and instinctively felt a connection that I wanted to pursue. Since then, we have tried to understand each other’s worlds, to see our different bodies – one tall, male, Irish, one shorter, Chinese, female – as a way to explore our different ways of being in the world and to investigate how to create an environment where those differences can coexist. We use the ancient Chinese Luo Shu grid as a framework for our performance but try to avoid the usual East/West division by drawing on a common spirit that connects us despite the obvious differences we present. Like our relationship, Dialogue evolves with each performance. We have worked with different composers and artists to enhance and clarify the work but the heart of the Dialogue remains the same.